One way that Millennials stand apart from previous age demographics is that they are the least responsive group to traditional marketing tactics. So, in addition to having to navigate the new world of online reviews, many hoteliers are finding that when marketing to Millennials, their usual approach to advertising is becoming less effective. 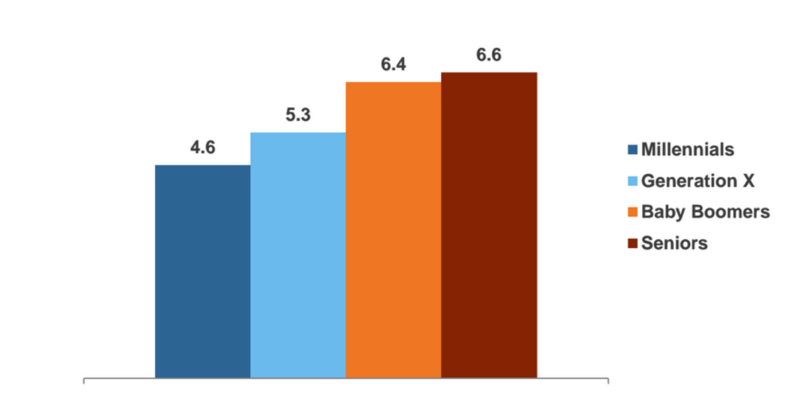 According to a 2012 study by comScore, average television ad effectiveness increases with age. Traditional ads get less and less effective with each new age demographic that comes along. Millennials (the youngest generation in the study) are more difficult to persuade via television advertising when compared to older viewers. The numbers above measure the increase in Share of Choice post-exposure to traditional advertising. The lower number indicates that fewer Millennial purchases were influenced by advertising, whereas the purchasing decisions of Seniors and Baby Boomers were more influenced by having seen advertisements. Since traditional marketing is less effective for Millennials, what should hoteliers do to capture their loyalty? Next week, Revinate is hosting a free webinar to discuss how hoteliers can reach Millennials. We’ll also host a Q&A session at the end of the webinar to help clear up any questions you might have.